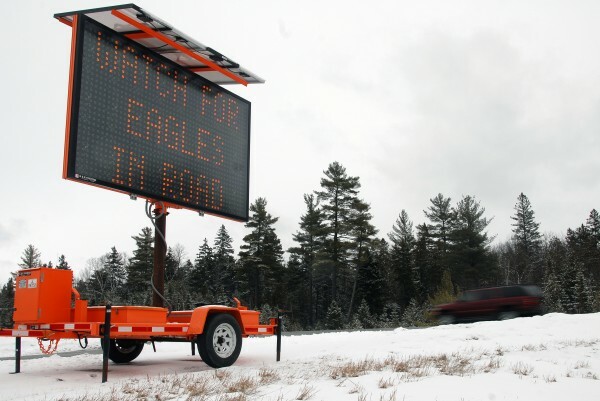 In an attempt to keep motorists from hitting eagles, state officials have set up a variable message sign newly set near mile 242 on Interstate 95 in Medway, seen here on Sunday, Feb. 24, 2013. Bald eagle populations in Maine have rebounded and in 2007, the bald eagle was removed from Maine’s endangered and threatened species list. 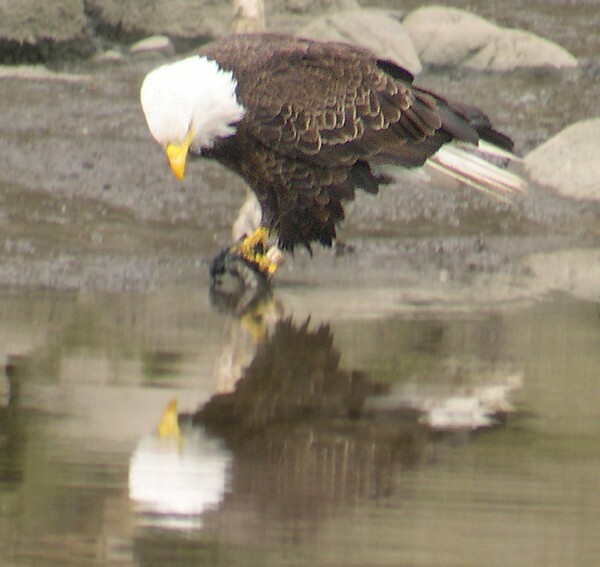 Bald eagles used to be an endangered species. Now they are numerous enough that state officials are working to keep them from becoming road kill. The confluence of the Penobscot River, Interstate 95 and Route 11 and the thick woods near them make a seven-mile stretch between Medway and Sherman the deadliest place in all of Maine for the state’s fledgling population of bald eagles, the state’s endangered species biologist says. The high number of eagles struck by vehicles along I-95 in that area prompted the Maine Department of Transportation about three weeks ago to place large variable-message signs between mile marker 242 in Medway and marker 249 in Sherman warning motorists to avoid eagles they see, said spokesman Ted Talbot. It is the first place in Maine where the department has placed such signs, Talbot said. Department workers are collecting dead animals along the highway every day to help keep the eagles away. “I had never heard of this before, nor had I thought of it,” Talbot said. Bald and golden eagles were removed from the endangered species list in August 2007 because their populations recovered sufficiently from decades of habitat destruction and degradation, illegal shooting and the contamination of its food source, according to the U.S. Fish & Wildlife Service. Bald and golden eagles are protected under the Migratory Bird Treaty Act (MBTA) and the Bald and Golden Eagle Act ( Eagle Act), federal officials said. Both laws prohibit killing, selling or otherwise intentionally harming eagles, their nests or eggs. The numbers generated by wildlife surveys show that the reported bird strikes in the Medway area vastly outstrip those reported in other places, said Charlie Todd, an endangered species biologist with IF&W. The numbers show the population growth that got the eagles’ designation dropped from endangered to protected. Of the 45 fatal eagle strikes reported since 1988, 36 occurred from 2005 to 2012, with 23 of those coming in December and March. A migratory bird, eagles live in male-female pairs and primarily feed from and live in woods along waterways such as the Penobscot River, which serve as travel corridors. With rivers being frozen in winter, eagles are forced to seek food from other places, such as roadways like Route 11 and I-95 where roadkill is common, Todd said. Eleven of the statewide eagle deaths occurred in March, Todd said. “That is a period when nesting eagles need to be near nest and the limited food supply [imposed by their inability to stray far from nests] makes scavenging [from roads] more likely,” Todd said. Since 2004, the 12 eagle deaths reported in the Medway area include 7 road kills, all but one along I-95. Nine of those 12 were reported since 2010, Todd said. In comparison, the next-deadliest place for eagles is Route 2 in Hersey, Molunkus Township and Silver Ridge Township, where three eagle deaths have been reported since 2010, Todd said. Given that the best estimates place about 2,000 eagles in Maine over much of the year, the number of deaths in the Medway area make it especially troubling. The Medway-Sherman corridor of I-95 is also a high deer crash area, making the sign selection process easy, Todd said. The area has a posted speed limit of 75 p.m. That combined with an eagle’s slow rate of descent and flat takeoff trajectory create situations that are often fatal to the birds, Todd said. “Any animal that doesn’t have that kind of maneuverability to get out of the way of a motorist” is a safety hazard, Talbot said. The large-format signs are difficult to miss. “We try to take as much action we can and try to make the motorist alert that they are in an area where this is more likely to happen,” Talbot said. Particularly troubling about the Medway area is the loss of eight adult birds — key players in the eagles’ continued population growth — since 2010. That compares unfavorably to the seven adult deaths since 2010 reported statewide, Todd said. It’s not possible to discern the impact of the signs and daily roadkill pickups just yet, Todd said. He said he hopes that it will become most evident next month, when the eagles begin their mating season. Todd and Talbot warned drivers to slow down as they travel through the area and to be extra watchful for eagles and roadkill. Drivers who see roadkill or other birds feeding, such as crows and ravens, should move to the lane farthest from the roadkill and slow down. “I have seen occasions where a moose has a foot in the roadway and a motorist doesn’t begin to stop. That’s scary,” Todd said.